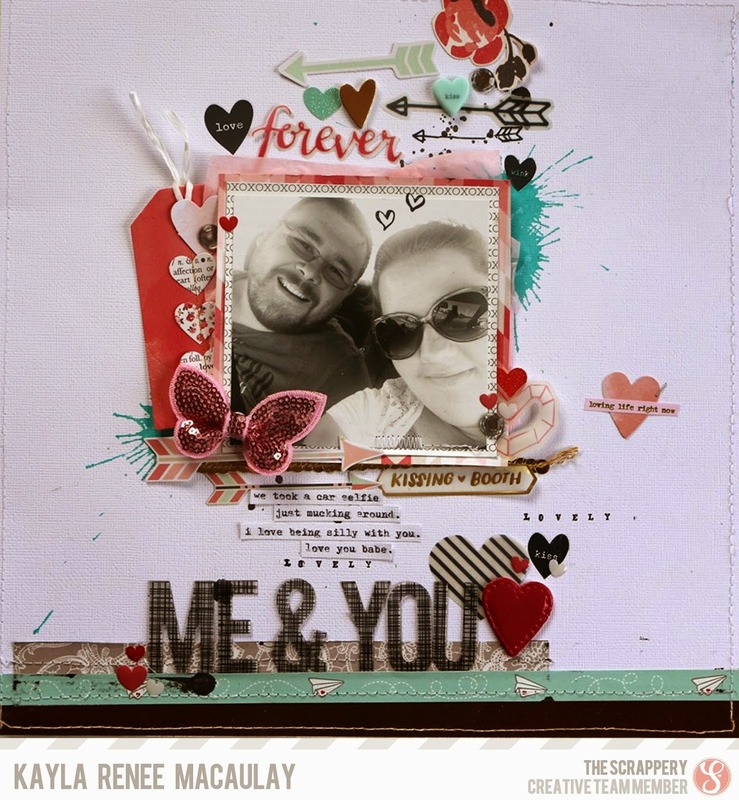 So today I wanted to come and share a layout I did recently using the February kits for THE SCRAPPERY. The month of February was very love themed and can you believe that this is the only love themed layout that I created? My partner and I took this silly car selfie on the way to somewhere and I love how it turned out because we both look so happy. I won't lie it has been a totally stressful 12 months and so to capture a happy photo is really special. We have had some many downs. I know life is full of ups and downs but it's hard to stay positive when there are so many negative things and so many stresses going on in your life..but I am still here...still breathing! I also recorded a process video for this layout which if you subscribe to my YouTube channel you wouldn't have seen as these Scrappery videos are only available for viewing on The Scrappery YouTube Channel..be sure to go and subscribe over there! I hope you enjoy watching it. I thought it was a rather fun layout to put together. Here are some close up images of the finished layout. I used a rotary alpha stamp to stamp the 'lovely' words over the page and I have used my trusty typewriter for the journalling. I keep a stack of 4x6 white Project Life cards to run through my typewriter for journalling strips. I also absolutely adore the Pink Paislee Bella rouge sequin butterfly. I think that is my favourite part of this page. The last close up of my page. I used a lot of arrows on this page. My friend pointed out to me that I usually 'point' my arrows on my pages to the right and apparently it is because I am right handed so on this page I pointed them to the left on the top half of the page and to the right on the bottom half. 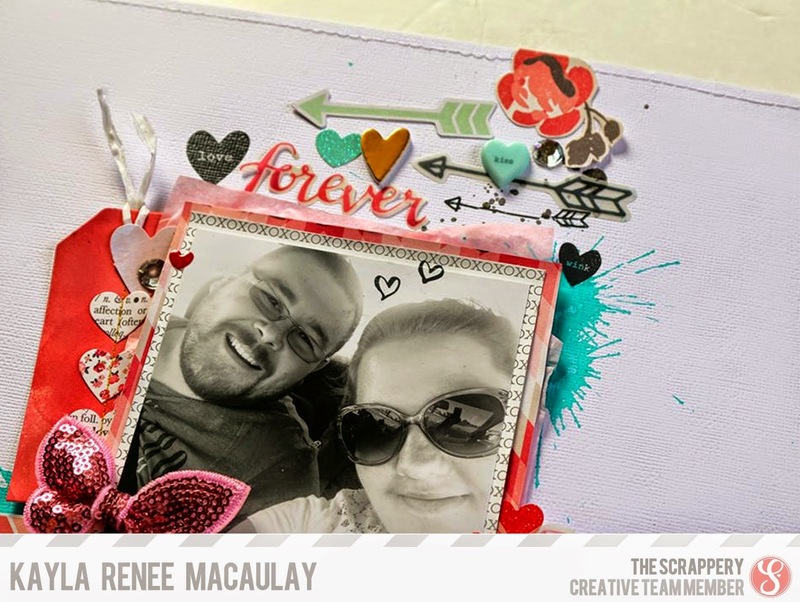 I thought that balanced it out a bit ;) I have also really been enjoying making these 'ink splatters' with the Tim Holtz Distress Stain and I can't wait to get my hands on the new colours that are being released monthly. I have ordered the January and February colours and the Mermaid Lagoon looks amazing! 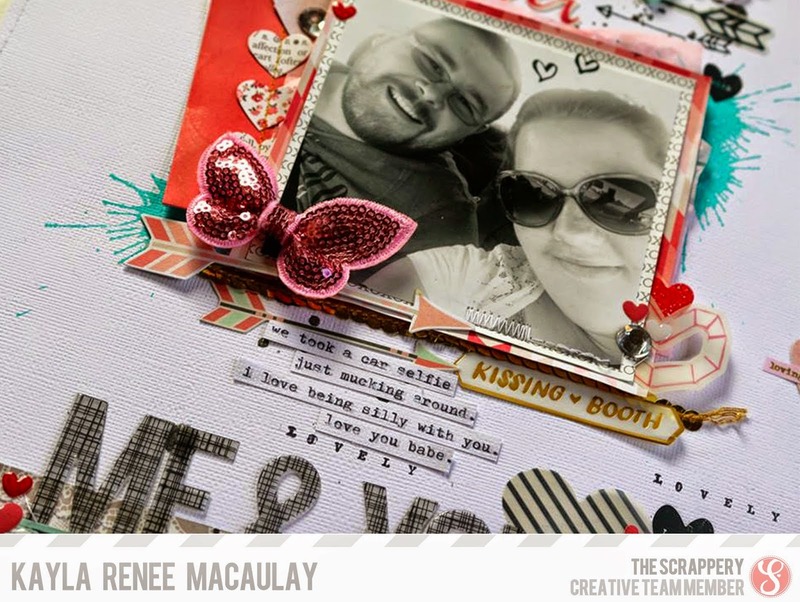 I hope you liked a little look at this layout. Will be back with more soon!